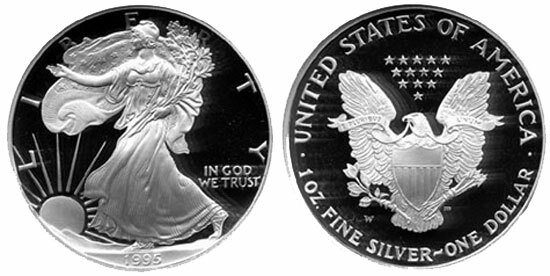 The 1995-W Proof American Silver Eagle remains the undisputed key date of the popular series and has come to represent one of the most coveted modern rarities. The issue was created to celebrate the 10th anniversary of the American Eagle program and only included within a special set containing four higher value gold coins. The unusual circumstances of the distribution led to very low sales and the extremely limited mintage of just 30,125 pieces. The American Silver Eagle was originally authorized under the Liberty Coin Act, which became Public Law No. 99-61 with President Ronald Reagan’s signature on July 9, 1985. The law provided for coins to be minted and issued with a diameter of 40.6 mm, weight of 31.103 grams (one troy ounce), and composition of 99.9% fine silver. The initial source for the silver would be the Defense National Stockpile. The authorizing legislation specified that obverse design was to be symbolic of Liberty, while the reverse design was to carry an eagle. When the series launched in late 1986, the obverse featured Adolph A. Weinman’s Walking Liberty design, which had appeared on the circulating half dollar issued from 1916 to 1947. The reverse design would feature a heraldic eagle designed by John Mercanti, who would later be appointed Chief Engraver of the United States Mint. The coins were offered in bullion format and distributed through a network of authorized purchasers with the pricing determined based on the market price of silver plus a fixed mark up. Numismatic versions of the coins were also offered, which for the initial years of the series consisted of an annual proof coin struck at either the San Francisco or Philadelphia Mint. Sales for the annual numismatic version reached more than 1.4 million for the first year of issue in 1986. This number declined sharply over the next two years, but settled around a steady average of five hundred thousand coins per year. In 1995, the United States Mint created a special 10th Anniversary Set to mark the important milestone in the series. The set included the four denominations for the American Gold Eagle as well as the American Silver Eagle, with all five coins struck at the West Point Mint and carrying the “W” mint mark. Since the individually offered proof Silver Eagle for the year carried the “P” mint mark, this set was the only source of the 1995-W Proof Silver Eagle. Over time, the allure and demand for this modern rarity has grown. This single one ounce silver coin has come to be valued higher than the other four gold coins included in the 10th Anniversary Set. The American Eagle Program entered its tenth year in 1995 and represented an occasion for celebration for the United States Mint. Since the introduction in 1986, more than 50 million Silver Eagle bullion coins had been sold, and Gold Eagle bullion sales accounted for nearly 6 million ounces. Numismatic offerings had also proven highly popular with collectors, with the annual offerings typically including an individual proof Silver Eagle and four different size Proof Gold Eagles. For 1995, the US Mint would offer the same standard options with a five coin set offered “as a special bonus” for customers. The standard options included the individual 1995 Proof Silver Eagle struck at the Philadelphia Mint and carrying the “P” mint mark. This coin was priced at $23 each. Four different 1995 Proof Gold Eagles were also available, with each coin struck at the West Point Mint and carrying the “W” mint mark. These were offered either individually or within a four coin set priced at $999. A special 10th Anniversary Set was also announced for availability in the Fall of 1995. This set would contain all five Proof American Eagle coins struck at the West Point Mint and carrying the “W” mint mark. While the Proof Gold Eagles were the same as available individually or within the four coin set, the Proof Silver Eagle with the “W” mint mark was only available within the set. The price for the anniversary set was the same $999 charged for the four coin set as a way of thanking customers for their support of the program. The anniversary set carried a mintage limit of 45,000 sets, but in the end only 30,125 sets were sold. By consequence, the 1995-W Proof Silver Eagle had a total mintage of only 30,125 and became the new key date rarity of the series by a wide margin. Some collectors complained about the manner of distribution for the coins, claiming that the Mint was forcing Silver Eagle collectors to purchase the higher ticket anniversary set in order to maintain their collections. Indeed, the price of $999 was far in excess of the modest $23 annual investment that had been necessary to keep up a set of Proof Silver Eagles. In the end the Mint did nothing to rectify the specific situation, although in subsequent years unique or special issue Silver Eagles have not been similarly combined with higher priced Gold Eagles. Compared to other Proof Silver Eagle issues, the 1995-W Proof Silver Eagle has a relatively low population, which is not surprising given its low mintage. With such a modern issue it can generally be assumed that the majority of examples struck still survive, although not all in pristine condition. The majority of the examples certified by the major grading services fall into the category of near perfection, with a steep drop off at the highest grade level. The Numismatic Guaranty Corporation or NGC has graded nearly 4,000 examples of the coin, with more than 3,000 receiving the grade of PF 69 Ultra Cameo. The number of coins receiving the highest grade is just over 300 pieces. The Professional Coin Grading Service or PCGS has graded about 2,500 examples with more than 1,600 receiving the grade of PR69DCAM and just over a dozen pieces grading PR70DCAM. It should be noted that the figures for Proof 69 graded examples no doubt include some resubmissions in hopes of attaining the elusive Proof 70 grade. The popularity of Registry Set collecting has served to increase the desirability and price levels for the small number of coins receiving the highest grade. Raw examples of the 1995-W Proof Silver Eagle with no obvious problems may command prices of around $3,000. Certified examples in the near perfect grade of PCGS PR69DCAM or NGC PF 69 Ultra Cameo may command prices slightly higher, particularly for the PCGS graded coins. Examples of the 1995-W Proof American Silver Eagle graded NGC PF 70 Ultra Cameo have recently realized prices of $15,000 or more. In a typical year, several examples graded as such may be offered at public auction. Examples graded PCGS PR70DCAM are much less frequently encountered and command significantly higher prices. In 2010, an example graded as such realized a record price of $40,000. This record was shattered on March 31, 2013, when another example realized the astounding price of $86,654.70. This represented the highest price paid for any American Silver Eagle and solidified the importance of this modern key date rarity.